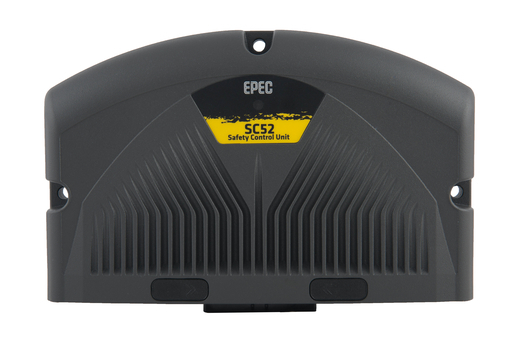 Epec SC52 is a state-of-the-art controller for safety-related systems in mobile machinery. Outputs in SC52 have a high-side current measurement, so only one I/O pin is needed to control proportional valves. SC52 offers a flexible solution for software-based safety function implementation. Together with the SC52 controller, Epec offers a set of pre-certified PLCopen application libraries in order to reduce customer’s safety related software development effort. The EU Machinery Directive 2006/42/EC sets requirements which machine manufacturers must comply to with their products. Also, new revisions of C-type standards have been published to align application-specific requirements with the Machinery Directive and state-of-the-art technology. For these demands, Epec has developed SC52 Safety Control Unit and a software ecosystem to meet all the technical requirements as well as business objectives. Our objective is to provide machine manufacturers with a complete solution to achieve the shortest time-to-market.